*Where members are noted, they are noted by their current or retired rank. Mr. Marshall was given access to the police photo archive and were used by him to develop a concept. He put together a collage of photos that depicted the evolution of the Service from its inception in 1899. The committee approved the final draft of the mural and work began on the carving. The mural was placed within the Police building in front of a wall that was originally composed of glass block, and separated the lobby from the Criminal Investigation reception area. Under the direction and support of Chief Bill Spring (1992-1996), the Centennial Celebration Committee was formed in early 1996 to prepare for the 100th anniversary of the Police Service. Staff Sergeant Jack Lemire was asked by the Chief to chair the committee and oversee the projects that were to occur leading up to and including the centennial year of 1999. During one of the first meetings, there was discussion on a major project to be undertaken and would be the focal point of the centennial year. There was discussion about a centennial sword or centennial rifle, however during one of the meetings, the Chief of the Regina Police Service who was meeting with Chief Spring, attended a committee meeting as their Service had recently celebrated their centennial. This Chief advised that they had wanted to use a sword as a major project for Regina, but ended up on pre-selling only 6 units so the project was scrapped. He also suggested that with the current firearms laws, a rifle might also be met with extremely low response. It was a result of this input that the committee decided to undertake the creation of a mural, and that they would approach local artist, James Marshall to create the design. Mr. Marshall readily agreed and indicated that he would donate the original printing plate and 300 signed and numbered prints as his contribution to the centennial. With the assistance of IXL and Goodyear who contributed cash and material to the project, the process began. Once the mural was complete, a date for the unveiling was set. The mural was unveiled by the son of Joseph McQueen a former Chief of Police for the Service (1940 to 1945) and Chief Eric Lloyd a long time member of the Service and Chief (1975 to 1984). At the unveiling, the donors were given a framed copy of the print as an appreciation of their support. The printing plate used to produce the numbered prints was cut down in size so that it could not be used to make additional copies and currently hangs in the lunchroom in the police building. This building was built in 1899 and was the area’s first courthouse and jail for Medicine Hat, N.W.T. It later housed the first police station. It was situated on the site of the current Legion building located at 702 2nd Street SE. This is a photograph of Joseph McQueen who was the 9th Chief of Police for the Service. Like most members employed during the war years, Joseph McQueen had ‘broken service’ with the department taking time out to serve his country during the first war. He started with the Service in 1912 and continued until 1915. 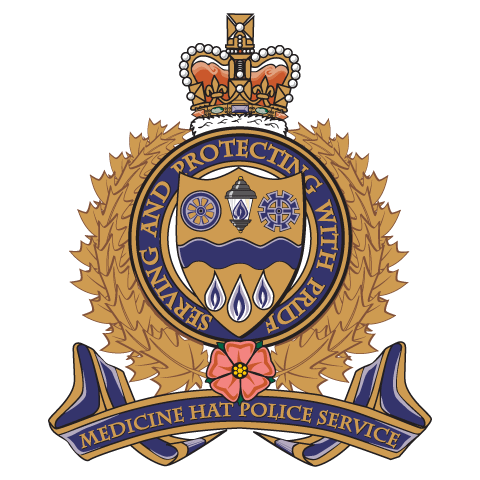 After serving in the Canadian Forces, he returned to the Medicine Hat Police from 1919 to 1946. He was Chief of the Service from 1940 to 1945. This photograph is believed to have originated in 1920. This is Constable Archibald Fisher using a horse to patrol the city. The Police Service employed Constable Fisher from 1922 to 1928. This particular photo is believed to have been taken around 1925. LEFT: Constable James Sheward who served from 1913 to 1915 and again from 1918 to 1940. MIDDLE: Sgt. Joseph McQueen who started with the Service in 1912 and continued until 1915. After serving in the Canadian Forces, he returned to the Medicine Hat Police from 1919 to 1946. He was Chief of the Service from 1940 to 1945. RIGHT: This member has not been identified. The vehicle in the background was one of the first vehicles used by the police to do their duties. This photo is believed to have been taken around 1935. This is Sergeant Jim Cairney who was one of, if not the first member of the Service to have patrolled Medicine Hat on foot, horseback, motorcycle and then automobile. This photograph was taken in 1942. Sergeant Cairney had a 40 year career with the Service from 1928 to 1968. This building served as the City’s police station from 1951 to 1965, after facilities in City Hall became outdated. The Provincial Court also occupied the 2nd floor of the building. The Canadian Coat of Arms that was displayed in the courtroom is now hanging in the lobby of the current police building after being discovered at a Stampede Grounds building when they were doing some cleaning. Retired Chief Eric Lloyd positively identified the artifact as being from this building. The Crown on the top of the artifact was broken off and had to be welded back in place. During the welding process, the heat used in the welding, burnt the paint off of the areas adjacent to the weld and as such was repainted before being hung in its current location. This building was situated along 1st Street SE where the current “Y” school is located. This photograph is a depiction of some of the early forensic photographic equipment that was used by our identification members. It was used to photograph fingerprints lifted from a crime scene. The member in the photograph is Sergeant Bob Pocsik who served between 1974 and 1999. This photograph is of Inspector Keith Bennett. It is unknown exactly when the photo was taken. Inspector Bennett served between 1952 and 1983. This photograph is of Inspector Rob Siegmund and Police Service Dog Smokey. Inspector Siegmund and Staff Sergeant Lou O’Reilly (and PSD Bandit) were the Service’s first K-9 members. The K9 unit was formed in 1980. This photograph is also of Inspector Keith Bennett and the child in the photograph is Paul Douglas. Paul is the son of Inspector Ron Douglas. It is unknown when this photograph was taken. This photograph is of Sergeant Bill McKenzie who served between 1932 and 1969. Sergeant McKenzie was in charge of the traffic unit of the Service for a lengthy period of time and can be seen in this photo using radar. This photo was taken for a crime prevention promotion. It features the Police Service’s first female officer, Constable Brenda Fisk. Constable Fisk served actively with the Service from 1986 to 1994 when she went on disability as the result of an injury received while working. She remains employed by the Service and is currently in charge of maintaining the Police Service website. The children in the picture are Michael, Lianne and Lisa Jacobs. They were the neighbours of Sergeant Ron White who took the photograph during his tour as constable in the Identification section. This was a ‘staged’ photo for the mural purpose and was designed to show the transition from the early days to the current manner of policing the city. The participants are Constable Larry Dirk and Staff Sergeant Andy McGrogan. Cst. Dirk served between 1980 and 2006 and Andy McGrogan has since been promoted thru the ranks and is the current Chief of Police.